The Zhenzheng lun 甄正論 (T 2112, Treatise of Revealing the Correct) is a Chinese Buddhist apologetic treatise with a distinct anti-Daoist stance in three juan. 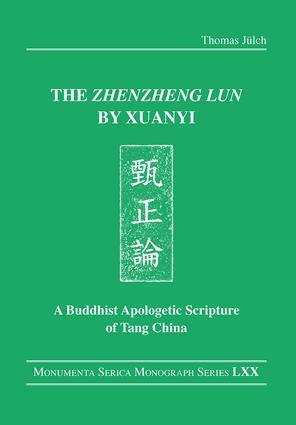 It is organized as a dialogue between a Daoist, the "Venerable Obstructed by Customs" (zhisu gongzi 滯俗公子), and the Buddhist"Master Revealing the Correct"(zhenzheng xiansheng 甄正先生) in which the former is gradually led towards an orthodox Buddhist understanding by the latter through the refutation of his various arguments against Buddhism. Composed in the late 7th century, the text was authored depending on the political interests and strategies of Wu Zhao武曌 (624–705), who in 690 was enthroned as Empress Wu Zetian 武則天. This study of Thomas Jülch offers a richly annotated and complete translation of the Zhenzheng lun along with an introductory part that focuses on reconstructing the political and propagandistic circumstances relevant to the understanding of the Zhenzheng lun. Thomas Jülch is a Postdoctoral Research Fellow in the Centre for Buddhist Studies, Ghent University, Belgium.